The visual senses are perhaps the strongest in the human experience. As such, it is no surprise that powerful lighting elicits powerful emotional responses. Because you cannot touch or feel it, people often do not understand why they should make sure lighting is a key component to their event. Lighting is the single most powerful element in transforming a space from drab to amazing. 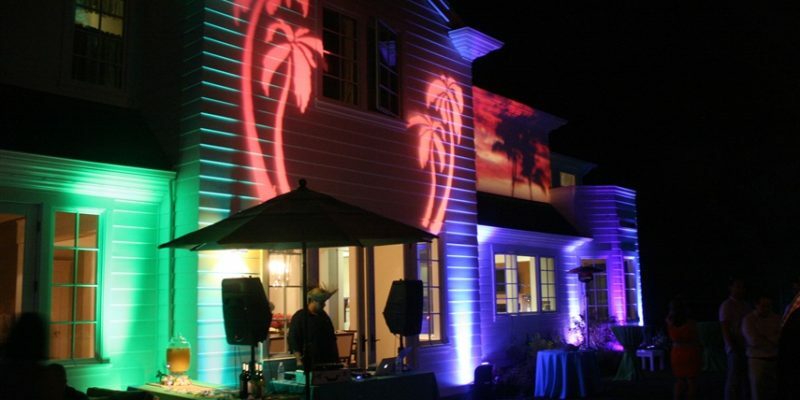 Inspire Productions specializes in Bay Area event lighting, and as a lighting company, as well as a turn key event company, we examine the complete experience and design lighting for every theme. We do this based on the client’s goals. Party lighting is different than wedding lighting, which is different than themed prop lighting. The largest component of creating great wedding lighting, event lighting, or any other event lighting, is to turn down the ambient lighting of the event space to 20 to 30% of its normal luminosity. A dark room, then allows a pallet for the lighting designer. Particularly if there are lighter walls for uplights. Each individual element can then be lit up and your event becomes romantic, exciting, and dynamic. Every item you brought to it also gets noticed. The Bar will be aglow in a blue hue, for instance. The buffet may be washed in a warm glow. If it is a wedding, the cake will be a shimmering star of the event, and everyone will see the well-lit wedding gift table. If it is a corporate event, any item of focus will also be showcased. By dimming down the main lighting, you will have a greater overall impact on the areas you are lighting. The colors will be more saturated, and the items you want to highlight will show up while some of the less attractive elements will disappear. Sometimes more affect is gained through less light.